If you would like to become an Intensive Care Nurse, you should take time to learn about the additional steps you will need to take to enter the field. Intensive Care Nursing, also commonly referred to as Critical Care Nursing, is a specialty that requires Registered Nurses to attain additional training and professional experience before they can get a position in the field. First, any nursing student interested in critical care nursing needs to understand what the environment is like. Second, it is important to know the timeline of training. Read on, and learn what you need to know to become an ICU nurse. What Does it Take to Work in The ICU Setting? 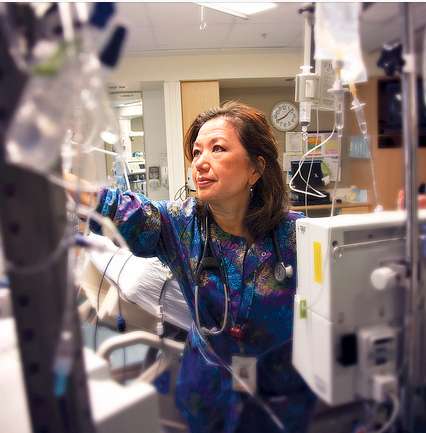 All nursing environments are chaotic and require you to react in high-pressure situations, but ICU nurses must be ready to make life and death decisions in the matter of seconds when they are working with critical care patients. To be an ICU nurse who will work with people in serious medical conditions, you must be able to stay calm when under pressure in addition to balancing a very demanding schedule. ICU nursing is not for everyone, but for people who will find delivering extensive care to critical patients and their families, this could be an extremely rewarding career path to take. Due to the fact that the demand for Intensive Care specialists is high, many nurses find jobs in this area as soon as they complete all of the necessary training. What Type of Training is Required to Work in Critical Care? The training that is required to become an ICU nurse can vary, but at a minimum you will need your nursing degree. Once you pass all of the necessary steps to become an Registered Nurse with your nursing degree or Bachelor of Science in Nursing, you will need to sit for your state’s nursing exam. Be sure to contact the board of nursing in your state to verify that you meet all coursework requirements before submitting your application. Some graduates will be lucky enough to land jobs in the ICU immediately after becoming an RN. While this is an option, most hospitals will require candidates to complete a special internship so that they can get hands-on training in critical care nursing. Another route to go is to take a Master’s degree program in Critical Care Nursing so that you can earn a specialization. Typically, graduate nursing students will either specialize in adult care or pediatric care when studying this specific type of nursing. You may also want to study a specific type of medicine so that you have specific duties and a role as an RN in ICU. According to The Hospitalist, the aging population and the shrinking number of professionals who are training in the field of critical care is becoming an issue in hospital environments. While this type of nursing is certainly not for everyone, there is a bright future for nursing students who have the qualities that are needed to function in the Intensive Care Unit. As the supply of ICU nurses continues to diminish, the gap between supply and demand gets larger. In a world where there will always be a need for professionals to take care of the critically ill, this is a stable career choice. Decide if you want to become an intensive care nurse and fill in the gap.